Does the prison hinder the fight against terrorism? 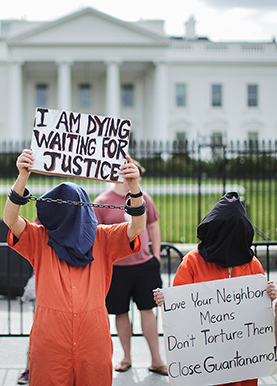 President Obama has tried for years to close the U.S. military-run detention facility at Guantanamo Bay, Cuba, and incarcerate terrorism suspects in the United States. Critics of Guantanamo say it serves as a potent propaganda tool for the Islamic State, which makes the prisoners it captures wear orange jumpsuits nearly identical to those worn by Guantanamo inmates. But Republicans and some Democrats have fought to keep the facility open, contending that transferring detainees to U.S. soil would be dangerous. The prison has drawn the opposition of many U.S. allies, who cite allegations of torture there. Democratic presidential nominee Hillary Clinton wants to close the prison, while Republican nominee Donald Trump vows to expand its use. The Obama administration has stopped sending new prisoners to Guantanamo and is steadily reducing the population — now 61 inmates — by transferring detainees to the custody of U.S. allies. National security analysts say the Guantanamo controversy underscores the need to reform how suspects captured in the terrorism fight are tried in court.